Arianespace launched the third Vega mission at the second attempt, completing a mission tasked with lofting Kazakhstan’s DZZ-HR Earth observation satellite, also known by the name KazEOSat-1, into a Sun-synchronous orbit. Launch occurred on time at 01:35 UTC (Wednesday UTC), with the rocket lifting off from pad ELA-1 at the European spaceport in Kourou, French Guiana. The launch was scrubbed shortly before Arianespace was due to start live coverage, with a postponement message greeting those ready to watch the launch. The company later released a statement, noting an issue with an umbilical connection between the pad and the vehicle. “Arianespace observed a non-compliant behavior of the payload’s ventilation umbilical during countdown after the gantry’s withdrawal. 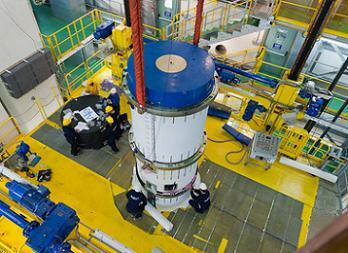 According to its quality policy, Arianespace has decided to perform an inspection of its facilities,” noted the release. The decision resulted in pressing ahead with a second attempt on Tuesday at 01:35 UTC. Launch occurred on time, without any issues. Vega also offers configurations able to handle payloads ranging from a single satellite up to one main satellite plus six microsatellites. T he second and third stages – designated Zefiro 23 and Zefiro 9, respectively – also use solid propellant motors, while the launcher is topped off by the bi-propellant liquid upper stage (called AVUM – Attitude and Vernier Upper Module). 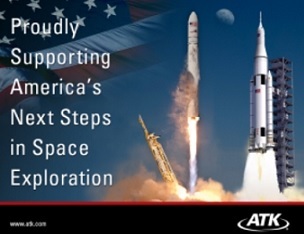 Although the debut launch was originally targeting 2007, the first mission – designated VV01 per Arianespace’s system – enjoyed a success launch, carrying nine satellites into space during its February 12, 2012 mission. A second launch saw the vehicle successfully loft its primary payload, the Proba-V spacecraft, along with the VNREDSat-1A and ESTCube-1 satellites. This flight had the VV03 designation in Arianespace’s launcher family numbering system which signifies the third flight of this vehicle, following missions conducted in May 2013 and February 2012. 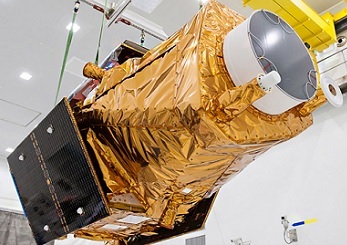 It was the second launch performed during April by Arianespace, following Flight VS07 with Soyuz – which lofted Europe’s Sentinel-1A Earth observation satellite on April 3. The 900-kg.-class DZZ-HR satellite was built for the Republic of Kazakhstan by Airbus Defence and Space. To be deployed in a Sun-synchronous orbit, it will deliver very-high-quality panchromatic and multispectral products for a wide range of applications – including cadastral surveys, management of natural resources, environmental monitoring and homeland surveillance. The spacecraft is expected to enjoy a service life of 7.5 years on orbit. Following liftoff from the Guiana Space Center, the powered phase of the first three stages of Vega lasted six minutes and 14 seconds. 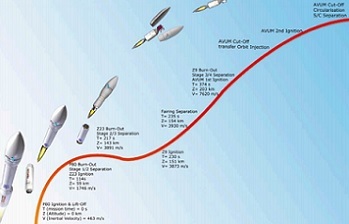 After this first phase, the launcher’s third stage separated from the upper composite, which includes the AVUM upper stage, a payload adapter and the satellite. The lower three stages fell back to Earth. 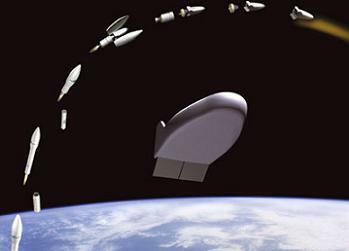 The AVUM upper stage ignited its engine for the first time, operating for about five minutes, followed by a ballistic phase lasting about 41 minutes. The AVUM stage then reignited its engine for about two minutes, prior to releasing the DZZ-HR satellite a minute after the engine was shut down. The DZZ-HR satellite was released at 55 minutes and 29 seconds after liftoff. Launched into a suborbital trajectory from Kourou, the IXV will return to Earth as if from a low-orbit mission, allowing for the testing and qualification of new critical technologies for future re-entry vehicle concepts.